The combines two of the convenience vpn features on the ScreenOS platform, dynamic routing protocol vpn and the on demand auto-complete vpn between spokes on a hub and spoke network. This allows a relatively standard spoke configuration process where only a few parameters are changed in the creation of a new spoke. But when the new site is added to the network full routing is established and efficient direct tunnels are created as needed. 1. 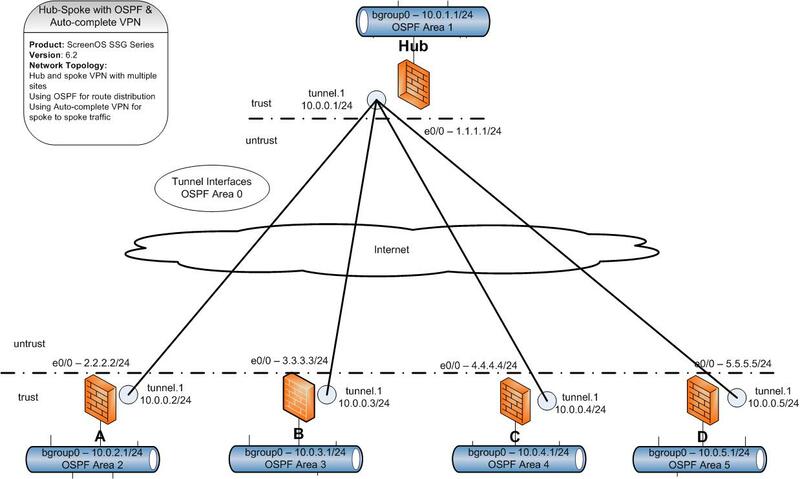 Configure base services on the hub location. This occurs only once and remains the same no matter how many spokes are added to the system. 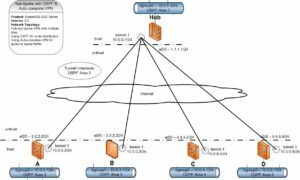 Running “get route protocol ospf” on a spoke should show the routes to all other spokes and the hub as learned from OSPF the capital “O” label below. This should contain all the connected spokes and the hub if routes are fully distributed properly.